Papercade won a Development Award for the "Best Social Game" at GameConnection 2015 in San Francisco. Taking place at the same time as GDC, GameConnection is a parallel conference that brings together professionals in the video game industry to develop their businesses and products. 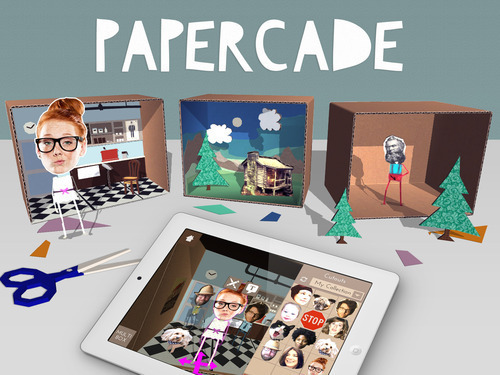 Hololabs was nominated in three categories for their work on Papercade, which also included "Best Mobile/Tablet" and "Most Creative & Original Project". The full list of nominees is here: http://www.game-connection.com/development-awards. When creating your games, you now have access to the new property inspector that allows objects to have different rules, animations and effects. Start by tapping the gear icon that appears above any selected cutout, and choose a property type for the object. It can either be a collectible (meaning, it is added to the score counter), a hazard (the player loses the box if they tap it), or simply destroyable (disappears when tapped). Deeper in the properties, you can configure when objects appear in the scene. For example, you may choose to reveal an enemy after a delay of 10 seconds, or only once the player has collected something in the scene. Once you start crafting with this updated version, you'll notice a new score counter and timer up at the top of your screen. These are both ways to set win and lose conditions to your diorama box and can certainly add a degree of challenge to your story. Tap the time button to open a slider that can be used to set the required time for completing your scene. Move the slider all the way to the left to turn it off, max it out at 60 seconds, or anything in between! The score box shows how many collectible items there are in the scene. You can use the property inspector mentioned above to set up collectible objects, and each one increases the required score for the scene, allowing for all sorts of skill-based games. 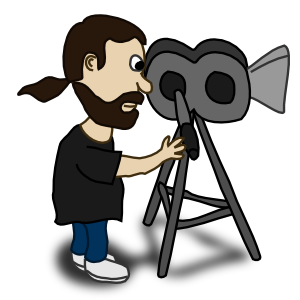 On the second tab of the new property inspector, you can now add customizable animations for your cutouts. There are currently two versatile options: Patrol lets an object move back and forth along a certain axis; speed and range is customizable. Random moves the object to a new location either after a customizable amount of time, or whenever an object is collected in the scene. Cutouts can now also be assigned a visual effect to add flare to your storygame. Add anything from an explosion to a tornado - let your imagination run wild! As a result of all these new features, we have replaced the existing creation kits with all new versions that show many variations and combinations of these new game behaviours. Click the create tab in the main menu and try them out! We can’t wait to see what you create with these new features! Remember to tweet us a screen capture, or share a video replay with us on Facebook, and let us know what you think. 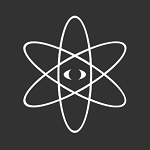 2014 has been an incredible year for us here at Hololabs, and we have you - our friends, family, and supporters - to thank for it! Lots happened this year, including some good funding news from the CMF, the launch of Phonophotopia, and of course, the worldwide launch of Papercade. There’s lots more in the hopper, and we can’t wait to share 2015 with you. 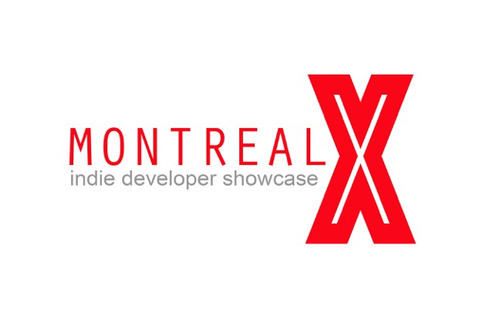 On December 4th, 2014 Hololabs will be joining nine other Montreal-based indie developers to showcase our games in the Quebec Government’s Rockefeller Center office. We will be there with Papercade, and Astrid will be moderating a panel discussion on the games industry in Montreal. This event is organized by Rogue Counsel, with support from Alliance Numerique and the Quebec Government Office in New York. For more information about who else is participating see the full event details over on Rogue Counsel’s site. A new update to Papercade is now live on the App Store: recording and sharing videos directly from the game. Videos, like this one, or this one, can be made while playing any of the mini-games in the Play tab or even while crafting your own. There are two types of videos that you can record, which are outlined below. At the end of any Papercade you will see a new button (under replay and like) that says Share Replay Video. Tap that button and you will instantly be able to share your gameplay with friends on Facebook, YouTube, Twitter, or by email. Before beginning any Papercade - where you see the game information if you’re playing, or the kit information before crafting - you will notice a new set of buttons at the bottom of the card (under the play / start craftingbutton). These are to enable audio recording or even a picture-in-picture video recording to accompany the gameplay. In the share window there are a couple other options available to make your Papercade video more personal. One is to add your own message and hashtags to encourage friends to watch your masterpiece. The other is to preview and edit the video by tapping the video thumbnail. That’s it! Remember to share your videos with us and the Papercade community on Facebook and Twitter. 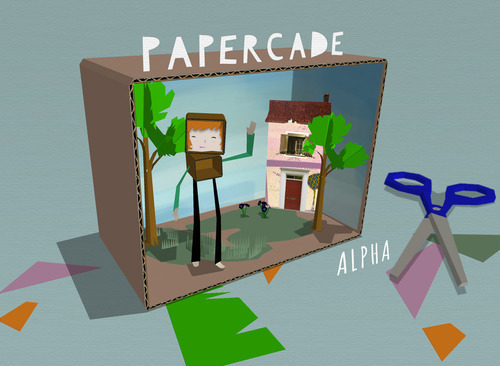 Watch the official launch trailer for Papercade! Coming soon to an iPad near you. 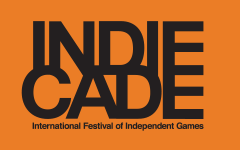 We are excited to announce that Papercade is an Official Selection at IndieCade, the International Festival of Independent Games. IndieCade’s mission is to support and promote independent game development around the world, and we are honoured to be included in this year’s impressive lineup. If you will also be attending IndieCade, taking place October 9-12 in Culver City, CA, please come by and scrapgame with us! We would love to meet you. For more updates about Papercade you can sign up for email updates on the website, or get social with us on Facebook and Twitter. Coming up this Monday (July 14) Mike will be at Critical Hit to chat about all things Papercade. He will also bring along a few iPads with the playable alpha for participants to try out! At Critical Hit 2014, participants game jam in one week intervals, pick their favourites, and then continue developing those selected into polished experimental games. As we work on getting Papercade ready to launch we have also been inspired by game jams. 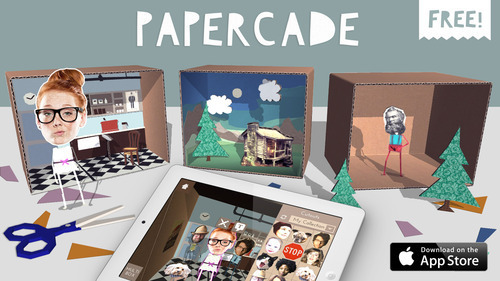 The amazing creativity and expression that come as a result of the structure and atmosphere of game jams are what inspired us to create the PaperJAM Challenges currently featured in Papercade. All in all we are really looking forward to sharing stories, tips, and contributing to the Critical Hit community. We are excited to announce that we are pulling back the Papercade curtain, so to speak, for a handful of people. These lucky few get to test out the game and give us feedback about what they like / dislike / would like to see in the future. This is a very important stage for Papercade as we work towards making the best game we can. 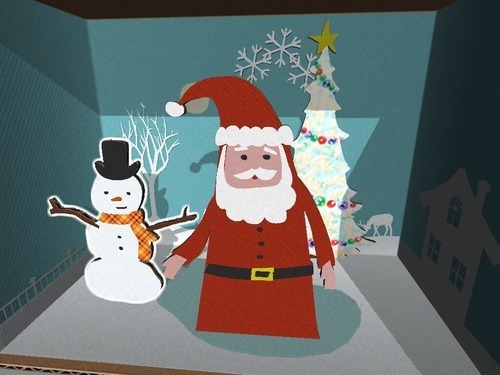 If you need a refresher: Papercade is a social storytelling and game creation app where players are invited to create and share story games in virtual diorama boxes using photographs and paper cutouts. 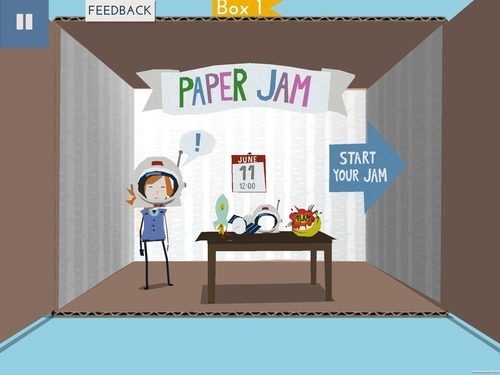 A newer feature we are working on are PaperJAMS. These are weekly creative challenges that give community members specific tasks to create a story game following a common theme. We have been working on Papercade for quite some time now (we’re coming up on a year of development later this summer!) and it is a thrill for us to finally share the game with enthusiastic new players. If you are interested in joining this great community of testers send over an email. You can also sign up for updates on the website, like the game on Facebook, or follow along on Twitter and Pinterest. 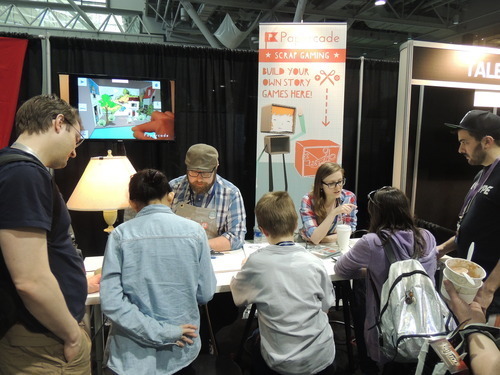 Oh and by the way, if you’re in the Montreal area and interested in working on Papercade (along with our other projects) remember to check out our latest job post. We are currently expanding our team in order to complete two upcoming F2P titles for mobile platforms. Candidates should have an interest in social, casual and mobile games. However, we are a small “indie” studio and ultimately seek passionate and motivated new team members that will grow with the studio and help to create amazing new products in the future. Feel free to come with your own ideas and help steer this studio towards success. Familiarity with version control (Git). Is this you? Get in touch! Send a CV to jobs@hololabs.org . In honour of innovative film maker Norman McLaren the National Film Board of Canada (NFB) has commissioned seven artists to create projection installations around Montreal. We are excited to announce that in collaboration with recording artist Kid Koala we have an interactive installation at Place des Arts in downtown Montreal entitled Phonophotopia. 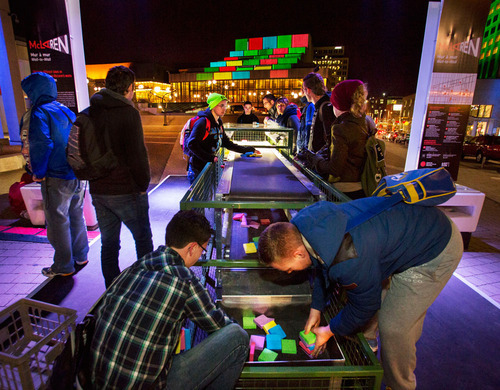 Inspired by Norman McLaren’s film “Dots,” anyone can place ‘dots’ (coloured blocks) on a film strip conveyor belt and watch as they come to life as they are projected onto Théâtre Maisonneuve at Place des Arts. Phonophotopia runs from April 11 to June 1, 2014 in the evenings. On March 22, 2014 Hololabs Community Director Astrid Rosemarin moderated a roundtable on the Canada Media Fund at the IGDA Montreal Roundtable night. The session, Demystifying the Canada Media Fund, was very well attended. There were participants who had applied successfully to the fund with practical advice for the other participants keen on learning more about the fund in order to one day apply in the future. We were also lucky enough to have Stéphane Cosentino from Telefilm Canada in attendance to give us some behind-the-scenes insight to the fund. Notes from the roundtable can be found on the IGDA Montreal website.